A couple of big news stories broke over the past few days in the world of Formula 1 which, once again, throws the sport into uncertainty. After an epic season which only just ended over a week ago, it's a shame to see it all fall to pieces now that the winter break is upon us. 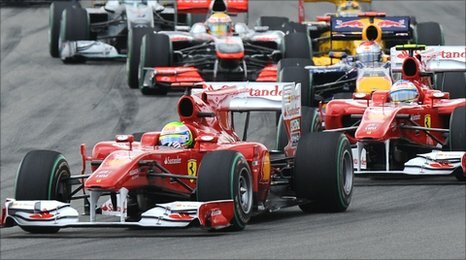 Ferrari and Red Bull have both announced their exit from Fota, the Formula One Teams Association. This is the team's united front formed to leverage the combined power of all the teams when negotiating with both His Highness, Bernie, and the FIA. This finally sheds some light over some comments raised by Luca Cordero di Montezemolo before the season ended - which really perplexed me as everything seemed to be going well. In their statement, Ferrari said: "Fota's drive has run its course." This was followed quickly by a similar announcement by Red Bull. The main argument seems to have come out of the Resource Restriction Agreement (RRA), drawn up by the teams and not part of the sporting regulations, means the teams have to limited their spend to make the sport more sustainable. Rumours flared about teams who did not adhere to the gentleman's agreement and overspent in 2010, giving them an unfair advantage. Still, Ferrari insists that they will continue to help fine-tune the cost reduction of F1. In other news, Bernie claimed that "Europe is over" for Forumla 1 and has initiated an eleventh hour bid to save the F1 race in Austin, Texas. In an interview with Spanish newspaper Marca, Bernie said that in the next few years, F1 races on European soil will be limited to just five. He also named three potential countries to take up the slack when he slashes European races: Russia, South Africa and Mexico.